I’ve used the Christmas break to get another new type of graphic finished, which is explained in full here and briefly below. Basically these are adapted from a very similar design by the excellent Swedish blogger Zorba138 intended to track both long-term performance and whether this was an underachievement or an overachievement based on the balance of chances created. There are two lines: one showing the rolling average of a club’s goal difference over the last 10 league games (blue line) and the other the rolling average of their expected goal difference (red line) based on the quality of chances they’ve created and faced. These are highlighted in blue (where goal difference is higher than chances created, suggesting overachievement) and red (for the reverse, signalling potential underachievement). Bolton look somewhat unfortunate to have been relegated last season, having mostly held their own in chance creation terms until a limp finish (their wasteful finishing let them down). This time around they’ve looked far more dangerous but their results are outstripping their performances and therefore they may not be able to sustain an automatic promotion challenge. Bradford started this season as strongly as they ended the last one, but both performances and results are now ebbing amid a worrying number of draws. Having begun this campaign as one of the promotion favourites, they need another upturn in performances to sustain a top six challenge. Bristol Rovers’ strong – and perhaps slightly hot – finish to last season saw them secure promotion but they’ve not looked out of their depth yet. The red line has stayed almost constantly in the positive despite some heavy recent defeats, so I wouldn’t start panicking just yet. For the second season running, Bury have started brightly and then dropped off, although this time around it’s been a far more sudden process. Results and performances have tanked sharply and in tandem, so there’s little to suggest bad luck in an eye-watering sequence of 12 successive defeats that took them from 3rd to 22nd. I wouldn’t have sacked Russell Slade on this evidence: the Addicks were sitting respectably in positive territory when he departed but their expected goal difference has since begun to dive. However there have been some tough fixtures lately so it’ll take longer to determine what effect the latest change has had. After a steady start things look to have gone south for the Spireites, although they’ve looked slightly better than recent results suggest. Last season they rebounded from a similar situation at this stage to finish seven points from danger, so perhaps history will repeat itself. The turning point for Coventry looks to have come halfway through last season, when their underlying performances took a noticeable dive from which they have yet to recover. A brief renaissance in October was quickly reversed and they’re now bottom of the pile after seven successive defeats. Fleetwood have had a bit of a crazy season so far, having looked in increasingly bad shape until mid-November before putting in some far more convincing performances of late. Interestingly their E ratings have been far less volatile, suggesting that they gave a decent account of themselves in a relatively tough sequence of matches. Millwall have looked consistently strong for a while now – the red line has ticked long almost entirely above the zero goal difference line – and after a horrible run of results (thanks to a bizarrely leaky defence) they’re starting to get the rewards. Having out-created their opponents overall, MK Dons have been underachieving all season so – depending on the cause – it could have been something that Karl Robinson would have been able to turn around eventually. Northampton overachieved massively in securing promotion last season – I’m not sure why but some smart recruitment looks to have been a factor – but they’ve adapted pretty well to League 1. Results have taken a turn for the worse lately but the red line is still hovering respectably near the zero line, suggesting that overall they’re giving as good as they get. Oldham were making steady progress last season – the red line ended the campaign a lot higher than when it began – but they’ve not started that well this time around. Some more encouraging recent performances haven’t been accompanied by good results, so some January shuffling may well be required. Having looked pretty convincing as they secured promotion last term, Oxford started the season poorly but have looked increasingly dangerous over the past few months. Results have been lagging but on this evidence they should be targeting a top half finish. Peterborough certainly aren’t boring but they look far less convincing than they did this time last season (based on the position of the red line) and could struggle to sustain their play-off challenge. Some big wins have kept their goal difference healthy but it remains to be seen if they can continue to overachieve as they have been. Oof. That’s a horrible graph. 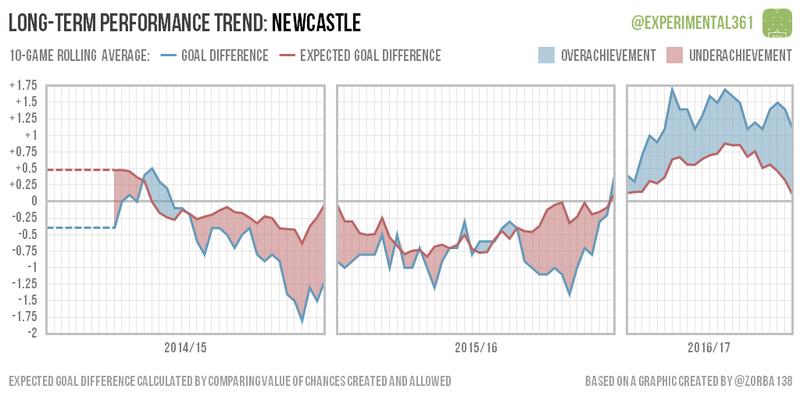 The model has been flagging Port Vale as being in trouble for a while now and both lines are diving into increasingly negative territory. Having started last season as positively as they ended the last one, things went south abruptly and it’s no surprise to see the manager leave. Rochdale have recovered from an awful start that looked more unlucky than deserved but still look to be underachieving. This mirrors their fortunes last term, although they were able to finish strongly after seemingly saving up most of their good luck for the Spring. I’m a little bit concerned about Scunthorpe’s promotion bid if I’m honest. Their underlying performances have been looking consistently more “top six” than “top two”. Of course they could well be one of those teams whose skill is sufficiently above average to sustain that big blue streak they’re enjoying (see Newcastle in the division above). Sheffield United’s poor start to the season always looked more unlucky than concerning and they’ve since made amends in style. Both lines have skyrocketed lately and if anything they might still be underachieving slightly. Shrewsbury have been struggling for much of the time since they rejoined this division at the start of last season, with a single bright spell above the zero goal difference line back in the Spring. Some more positive recent results haven’t yet been accompanied by noticeably better performances, but it’s still relatively early days. Southend are mounting a pretty impressive recovery at the moment. They began the season in dire form – which continued some consistently worrying performances from last term – but have gone from strength to strength and are looking far more convincing than they did at any point last season. Swindon fans endured a rollercoaster last season, starting and ending badly with a nice bump of seven wins in ten near the middle. While performances began respectably enough this time around, they’ve been heavily outplayed in recent matches and look a shadow of themselves two years ago. While Walsall came impressively close to securing promotion last season, it looks like performances were already beginning to stutter before results followed suit. After a summer of having their squad raided, the replacements haven’t fared nearly as well and they’ve actually been overachieving despite sitting far lower in the table. It took a while for their results to follow suit, but Wimbledon looked consistently strong in achieving promotion last season. They’ve continued to do so despite having made the step up to League 1 and their steadily positive performances suggest they’re capable of establishing themselves at this level.